The Society for Danish Language and Literature (Det Danske Sprog- og Litteraturselskab, DSL) is an independent institution supported by the Danish Ministry of Culture, the Carlsberg Foundation, and a series of other foundations. DSL is charged with publishing and documenting Danish language and literature from the earliest times to the present day. 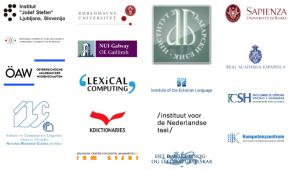 The aims of DSL are to edit and publish works from all periods of Danish literature, bibliographies as well as documents regarding Danish history written before the year 1450. Furthermore DSL edits and publishes a large number of scholarly dictionaries as well as lexicons for NLP, and builds text corpora and other electronic language resources, e.g. as resources for dictionary-making. Sanni Nimb (PhD) is a Senior Editor and researcher at DSL. She edits modern Danish Dictionaries (the online dictionary DDO and the Danish Thesaurus), and compiles lexicons for NLP based on the two dictionaries. She is the main editor of the published first edition of the Danish Thesaurus (2014), and established the xml-structure and the set of formal relations used to annotate semantic groups across the thesaurus vocabulary. Her research interests are devoted to computational lexicography and formal lexical semantics. Thomas Troelsgård (MA) is a Senior Editor and researcher at DSL. He works primarily with structuring, manipulating, extracting and converting dictionary data. Currently he is also working on linking entries across a series of historical dictionaries, as part of a project with the goal of building a website that describes the language and music in Danish hymnbooks of the 16th century. He also works on a sign language corpus and dictionary project at University College Copenhagen. Nicolai Hartvig Sørensen (MA) is a Senior Editor and researcher at DSL, working mainly with the IT infrastructure of modern and historical dictionaries. He has previously worked on the Danish wordnet (DanNet), and semantic annotation using that resource. His current research interests are devoted to computational lexicography and the application of word embeddings in lexicographic work.